You don’t have to travel to New England to enjoy the beauty of trees in vibrant fall-colored foliage. 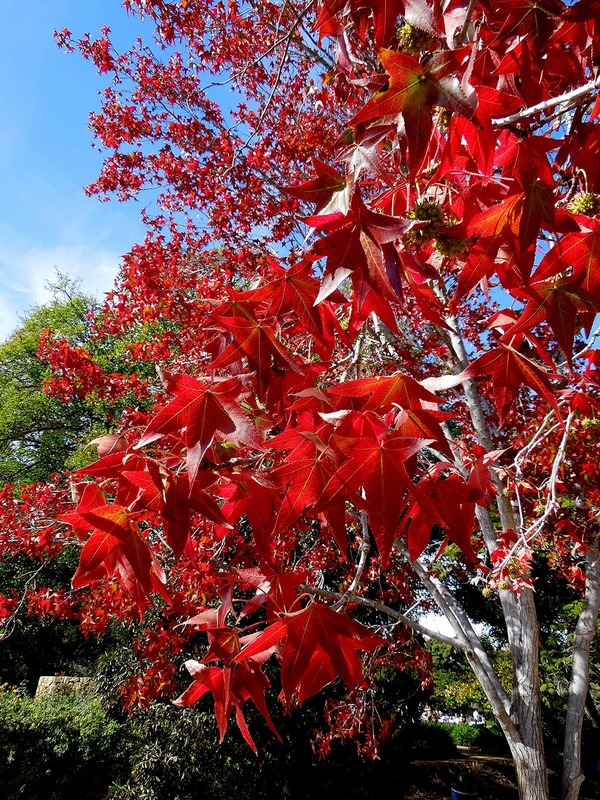 Without a doubt, the Liquidambar trees planted here in Santa Barbara sport leaves in such glorious reds, oranges and yellows that they easily rival eastern maples! Not surprisingly, with their distinctive 5-pointed, star-shaped leaves, Liquidambars are often confused with true maples. Liquidambars are actually native to the southeastern U.S. Their botanic name is Liquidambar styraciflua, which refers to the fragrant orange sap, or gum, that can flow from bark wounds. This sap flow also gives them the common name, “Sweet Gum”. They are fast growing trees and can reach 50’ in height and 30’ in width. They do best in deep, well-drained soil and require very little care, other than occasional irrigation when young. While they are easily grown from seed, its best to plant trees that have been grafted, in order to ensure specific characteristics – such as growth habit and leaf color. Some of the most popular varieties are “Burgundy” (which has a deep-red to purple fall color which persists through winter), “Palo Alto” (which has a columnar growth habit and yellow to red fall color), and “Rotundiloba” (which is sterile, thereby eliminating the drop of prolific, spiked, seed capsules that can be painful to bare feet). Liquidambars standing in the cooler areas of our town tend to have the richest and deepest fall colors earlier in the season. 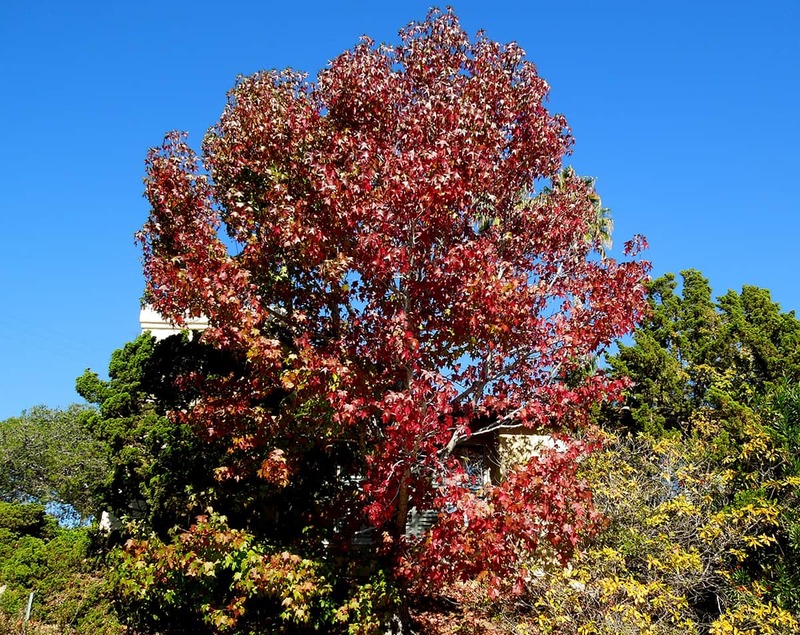 The best specimens of mature Liquidambar trees with outstanding fall colors can be seen in the Hidden Valley neighborhood – on Torino Drive, Barcelona Drive, and lower Palermo Drive. Other fine examples are located on Alan Road (at Cliff Drive), on the 300 block of East Pedregosa, on Cota Street (in front of the Santa Barbara Junior High School), Grove Lane, and in the Alice Keck Park Memorial Gardens. Younger Liquidambar ‘Rotundifolia’ are found on Laguna Street (in front of Roosevelt School). Tree-of-the-Month articles are sponsored by Santa Barbara Beautiful, whose many missions include the increase of public awareness and appreciation of Santa Barbara’s many outstanding trees and, in a long-time partnership with the City Parks & Recreation Department, the funding and planting of trees along the City’s streets – a project which has resulted in the planting, to date, of more than 12,000 street trees!